A complete guide for the thoroughly modern healthcare marketer. This unique guide also comes with a CD-ROM containing ready-to-use customizable forms, checklists, and other tools and examples that will help marketers promote quality, create a buzz, and face challenges within an organization, including internal marketing. 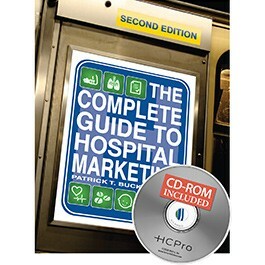 Chapter 1 What Is Healthcare Marketing? Patrick T. Buckley, MPA, is a national healthcare consultant who has worked with a variety of healthcare organizations across the country. Buckley has more than 20 years of experience in brand and corporate image consulting, strategic planning, marketing, advertising, and business development for the healthcare industry. He is the author of two other HealthLeaders Media books, the first edition of The Complete Guide to Hospital Marketing, and Physician Entrepreneurs: Marketing Toolkit.